Step 1 Preheat your oven to 400ºF. Step 3 Slice the fennel thinly. Remove the skin from the eggplant with a vegetable peeler and slice that thinly as well. Place the eggplant and fennel, drizzled with olive oil and s & p, on a baking sheet. Bake until the eggplant has softened–about 12 minutes (depending on the thickness of the slices). The eggplant will likely soften before the fennel. Remove the eggplant from the pan (adding it to the mixing bowl, see below) and continue to cook the fennel until it develops a bit of color and is soft. Step 4 In a large soup pot, saute the onion and garlic until it’s soft. Add about 1/4 of the onion & garlic mixture into a large bowl, leaving the other 3/4 in the soup pot. Step 5 Once the eggplant is out of the oven, run your knife through it until it’s been pulverized, add to the mixing bowl, along with the lemon zest, mint, ground turkey, egg and some s & p. Mix well with your hands. The mixture will be wet. Step 6 Scoop the meatballs, using a cookie scoop or spoon, onto a greased baking sheet (once the eggplant and fennel are done, just use the same baking sheet) and bake until they’re cooked through and have some brown-ness to them, about 15 minutes. Step 7 To the soup pot, add the cooked fennel, lemon juice, chicken stock and 2 cans of crushed tomatoes. Let it come to a simmer. Step 8 Add the meatballs to the soup pot and let it all simmer together for a few minutes before serving. Meatballs that are breadcrumb and gluten free, check. We know that’s possible. What about meatballs that don’t need almond flour? Cccchhheeccckkkkk. 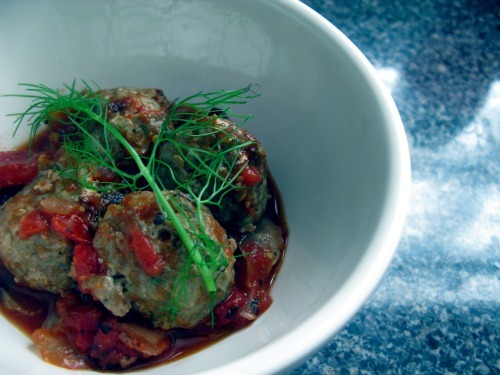 We were inspired by our love of lemon and mint to make these Greek flavored meatballs. The only logical choice for a bread crumb/almond flour alternative was….eggplant.